Figure C shows the relationship between creativity and learned craft (Teknik). 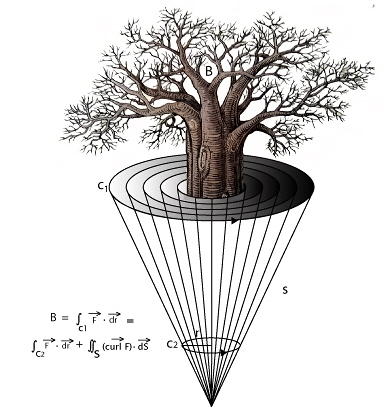 C2 (artistic scope of gamut) must be maintained equal to circumference of B (Baobab). Their diameter is the constant f (the Franzen measurement). The intending author must maintain the trajectory of the plot within an angle which leads from zero through C2 to C1. Bisected, C1 gives the character arc of the protagonist (C.A.P. ); the character retrograde arc of the protagonist will then be descriptive of the work as a whole. The equation C2(f + C1) = 3Ï€ (SÃ·C2) can be used by the author at any point to test whether or not the novel (n) is going to sell (das Geld).